from "One Life to Live"
I was in my house in New Berlin. A woman came to the door who was the wife of a prominent politician. I was surprised to see her there. When I wasn't paying attention, she went into the livingroom and set the drapes on fire. I ran into the livingroom, and using the lower portion of the drapes, I put out the fire. Then I grabbed her by the hand and dragged her with me to the telephone. I planned to call the fire department using 911, but the fire was already out, so I called 911 to call the cops to have her arrested. The woman cop on the phone wasn't interested because the fire was out so it was no longer an emergency. So I dragged the woman outside. I thought I'd take her to the police department myself. But as soon as the woman got into the car, she tried to set the car on fire. So I dragged her back out of the car and tried to get away from her, but I didn't have all of the car doors locked and she managed to open the car door again and tried to get back in. So I dragged her back out of the car and got all the locks locked, but I didn't realize the window as open and she opened the lock and got into the car again and tried to set it on fire. I noticed at this time that the locks on the car were number 11. Note that there are 4 locks on most cars. So, I tried to make a game of it and pounded on the door lock with my first, and she pounded on my fist, so I pounded on her fist with my other fist, then she pounded on my other fist with her other fist. We started laughing and she said, "We could go on TV with this!" But she was dangerous, so I got out of the car and she got into the car to drive it away and kill herself. I let her go and woke up. After I woke up, I realized that the woman was the crazy woman 'Barbara Garrick' (Allison Perkins) from 'One Life to Live' TV show. I felt very ill at ease, having woken up in fear. As I lay there, I started having visions about what each of the door locks meant. 1. 'The door lock represents the problem between India and Europe. 2. " The door lock represents 'Brigid' 45"
3. "The door lock represents a fire in Great Britain in the House of Commons"
What does the 4th lock represent? The automobile represents the physical self as well. What is 11:11? We have written about it several times, and other people have written about it many times. Some people think its a wake-up call and I agree with that, because people have been seeing this number everywhere for many years. Other people think a wondrous event is going to happen and think it represents stargates opening up. Solara has written about this number for years, and wrote a whole book about it. Joe Mason has also written about the 11:11 and his worry that something stressful was going to happen on August 11 at 11:11 a.m. in 1999 or related to it. That is when the eclipse crossed Europe. That same day, a rare tornado occurred in Salt Lake City with many symbolisms in the event, which we wrote about. There was a plane crash - Flight 111 which was on a path of the exact same path as the eclipse of August 11, 1999. It occurred on September 2, 1998. We thought that if the 11:11 was what we thought previously, people would stop seeing it, but they didn't. People are still seeing it, including myself. So, there is still another future event which the 11:11 represents. Something bigger than what has already been seen. Revelation 11:11 is: And after three days and an half, the Spirit of life from God entered into them, and they stood upon their feet; and great fear fell upon them which saw them. Rev 11:2 But the court which is without the temple leave out, and measure it not; for it is given unto the Gentiles: and the holy city shall they tread under foot forty [and] two months. Rev 11:3 And I will give [power] unto my two witnesses, and they shall prophesy a thousand two hundred [and] threescore days, clothed in sackcloth. Rev 11:8 And their dead bodies [shall lie] in the street of the great city, which spiritually is called Sodom and Egypt, where also our Lord was crucified. Rev 11:14 The second woe is past; [and], behold, the third woe cometh quickly. Rev 11:15 And the seventh angel sounded; and there were great voices in heaven, saying, The kingdoms of this world are become [the kingdoms] of our Lord, and of his Christ; and he shall reign for ever and ever. Read about Joe Mason's experiences of dreams and amazing coincidences that reveal the nature of humanity's path. Joe's research involves crop circles, giant ground markings, the 11:11 coincidences, other strange phenomenon, and universal myths/religions, making it clear that humanity has been on an ascending path that corresponds to the chakra levels of the spiritual body of mankind. All truth goes through three stages: First it is ridiculed. THE SOLAR ECLIPSE OF AUGUST 11, 1999 AT 11:11 A.M. In the early hours of Monday 3 February, five members of the pacifist <http://www.catholicworker.org/>Catholic Worker Movement ( <http://www.geocities.com/londoncatholicworker/>2 ) cut their way into <http://www.refuelingpeace.org>Shannon Airport ( <http://www.shannonpeacecamp.org/>2 ). The peace activists poured human blood on the runway that has been servicing <http://www.indymedia.ie/cgi-bin/newswire.cgi?id=26231&start=80>U.S. military flights, troop and munition deployments to U.S. military bases in Kuwait and Qatar. They constructed a shrine on the runway to Iraqi children killed and <http://www.indymedia.ie/cgi-bin/newswire.cgi?id=26625>threatened by U.S./British bombardment and <http://www.casi.org.uk/>sanctions. The shrine consisted of copies of the Bible and Quran, rosary and muslim prayer beads, flowers, photographs of Iraqi children and Brigid's crosses. They then began to take up the runway, working on its edge with a mallet. Despite other media <http://www.indymedia.ie/cgi-bin/newswire.cgi?id=26640>giving space to reports of a Garda being assaulted or overpowered, this was <http://www.indymedia.ie/cgi-bin/newswire.cgi?id=26658>refuted by the protesters themselves. Ciaron O'Reilly, one of the Catholic Worker activists arrested, said today that they had indeed met a Garda who, rather than being overpowered, had had a kind of stress/panic reaction to their presence and had become upset. According to Ciaron the Garda was concerned with his job and with the reaction of his superiors. Ciaran made it clear that at no point had the Catholic Worker activists approached, attacked or restrained the Garda and that he was their arresting officer. Ciaran is further reported as saying that the five Catholic Worker protesters were themselves upset by the Garda's reaction and had attempted to comfort and reassure him. (CBS) Nuclear rivals India and Pakistan exchanged fire across their border in Kashmir on Monday, and the Indian military reportedly took control of the country's paramilitary forces and merchant marine in a sign of building tension over the disputed Himalayan region. An Indian news agency reported India's army had been asked to consult a top secret set of directions from the government, known as the War Book. Each side in the simmering conflict sought to bring international pressure to bear on the other. India said it asked foreign help in isolating Pakistan, which requested international assistance in starting talks to settle the territorial dispute. The Bush administration urged talks between the two nations on Monday and made plans to send Deputy Secretary of State Richard Armitage to try to ease tensions. Implicitly criticising New Delhi for ordering the expulsion of Pakistan's ambassador to India on Saturday, the State Department spokesman Richard Boucher said, "We, in fact, encourage them to continue a dialogue, not to cut off channels." India withdrew its own ambassador from Islamabad in December. India has refused to negotiate until Pakistan stops its alleged support for Islamic militants who have launched attacks on the Indian side of the border in Kashmir. Pakistan denies backing the militants but does support the goal of separating the Indian portion of mainly Muslim Kashmir from Hindu India. The two nations have sent about 1 million soldiers to their frontier as the dispute flared anew over Kashmir, which has provoked two of the wars the countries fought since independence from Britain in 1947. U.N. Secretary-General Kofi Annan called on both sides "to exercise maximum restraint to avert a further escalation of tensions," U.N. spokesman Fred Eckhard said in New York. He said Annan also was "very concerned" at the high level of casualties due to persistent firing along the Line of Control, the 1972 cease-fire line that divides Kashmir. The Press Trust of India news agency reported India's powerful interior minister, Lal Krishna Advani, said the army had been asked to consult the War Book, the government's record on offensive operations. The day-to-day chronicle of past wars and battle plans is so secret that it is handed personally by the civilian authority to the military authority, and is consulted only when the army is asked to prepare for war, a senior army officer told The Associated Press on condition of anonymity. Press Trust of India quoted Advani as saying the decision to put paramilitary troops and the merchant navy under the military command was "an indication that we are moving in a certain direction." Indian and Pakistani forces blasted each other's positions with small arms and mortars for a fourth day across their Kashmir frontier, and police said a soldier and a civilian were killed when two villages in the Indian-controlled portion of Kashmir burned in a fire started by Pakistani shelling. More than 5,000 villagers fled the area last week. Pakistan said India fired first on civilian targets. "The Indian army is deliberately targeting civilians and Pakistan is retaliating wherever it is required," military spokesman Saulat Raza said in Islamabad, the capital. The Indian army says it does not target civilians. Indian police also said suspected Islamic militants killed two Indian soldiers and wounded six others on Monday in India's Jammu-Kashmir state. Suspected militants also shot and killed one Indian soldier and wounded two others guarding an army camp in Manjakot, 110 miles north of the state's winter capital, Jammu, said state police spokesman Subhash Raina. Guerrillas also ambushed a paramilitary patrol, killing one police officer and wounding two others 130 miles northeast of Jammu, and blew up an army vehicle on the highway linking the Kashmir Valley with the rest of India, injuring two soldiers, Raina said. India's Foreign Ministry said diplomats will explain India's position to foreign governments, asserting that Pakistan is responsible for militant attacks in Jammu-Kashmir. "We have had pain inflicted on us for far (too) long," Indian Foreign Ministry spokeswoman Nirupama Rao told reporters in New Delhi. "The prime thrust of any diplomatic offensive would be sensitizing the world community to India's very legitimate concerns about cross-border terrorism." Pakistan repeated its offer Monday to hold talks to resolve the 55-year dispute over Kashmir. In Islamabad, Rao's counterpart, Aziz Ahmad Khan, said, "We hope the international community will increase further its efforts ... to convince India to see reason and come to the negotiating table for discussions and dialogue with Pakistan." India refuses to hold talks with Pakistan, saying it has not done enough to stop incursions by Islamic militants. Jammu-Kashmir state officials and human rights groups say 60,000 to 70,000 people have been killed since the insurgency began in 1989. The latest tensions were caused by an attack on an army base in Jammu-Kashmir last week that killed 34 people  mostly soldiers' wives and children. India blamed Pakistan, and two Islamic guerrilla groups based there. Pakistan condemned the attack and denied involvement. Over the weekend, firing between Indian and Pakistani forces and attacks by militants killed at least 15 people in Kashmir. Thousands of villagers fled their homes on both sides. © MMII, CBS Worldwide Inc. All Rights Reserved. (CBS) India said Sunday it will test-fire a long-range missile that experts say could deliver a nuclear weapon as far as Moscow or Shanghai. The United States and other western countries had urged India to abandon development of the Agni III missile, saying they are worried about an escalating nuclear arms race between India and its archrival, Pakistan. The test firing of Agni III is overdue and we feel the need for that long-range missile as part of our policy of deterrence, Defense Minister George Fernandes was quoted as saying by the Press Trust of India news agency. The date has not been firmed up. (The) effort is to see that it is test fired this year, he was quoted as saying. India says it needs the missiles to defend itself against its neighboring rivals, Pakistan in the west and China in the north  both of which have waged war with India in the past. Fernandes also said that India had put on hold the development of the Trishul, a surface-to-air missile that would target aircraft and counter sea-skimming missiles. The current versions of the Agni  I and II  are being produced and are ready for deployment by India's armed forces, Fernandes said. Both are capable of carrying nuclear warheads. The Agni I has a range of 435 miles, and the Agni II has a range of up to 1,400 miles, capable of hitting targets anywhere in Pakistan and deep into China. Agni means fire in Hindi. Development of the Agni III reportedly began as early as 1999, according to the Federation of American Scientists, an arms control watchdog group. The group said the missile likely has a range of 2,100 miles. India's missile arsenal also includes the short-range ballistic missile Prithvi with a range of 95 miles; the surface-to-air Akash and the anti-tank Nag missile. India has also recently tested the supersonic Brahmos missile, also capable of hitting Pakistani cities and developed in a joint program with Russia. The Brahmos has a range of 185 miles and has a payload of 440 pounds but cannot carry a nuclear warhead. It flies at more than 1,400 mph, twice the speed of sound, and has three versions  ground-to-air, air-to-ground and a navy version. India conducted its first nuclear test in 1974. Its nuclear tests in 1998 caused international outrage and provoked economic sanctions by the United States and other Western nations. 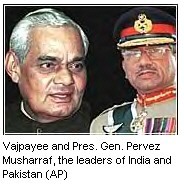 Pakistan followed suit with nuclear tests of its own. Western nations gradually lifted sanctions against both India and Pakistan as the two countries became allies in the international campaign against the al Qaeda terror network and the Taliban militia in Afghanistan. ©MMIII, The Associated Press. All Rights Reserved. US President George Bush and British Prime Minister Tony Blair will meet in Northern Ireland this week to discuss the war in Iraq and the Ulster and Middle East peace processes. With US troops poised to enter Baghdad, the pair will discuss the battle plan and proposals for managing post-war Iraq, including the issue of determining what role the United Nations will have, even as European foreign ministers debate the same matter. While the White House insists that no decisions have been made, spokesman Ari Fleischer made it clear on Friday that the US role is certain to be greater than many in Europe would like. The UN, Mr Fleischer said, will have a role in providing humanitarian aid and in the reconstruction. But the US, he said, will be in charge of administration. "Don't think for a minute that we will not have a role," he said. The US and Britain will provide security, he added, as well as running "some kind of civilian administration" that works with General Tommy Franks, commander of coalition forces in the Persian Gulf. France, Germany and Russia argue that the UN should assume the key administrative role to give the post-war government international legitimacy. The French foreign minister, Dominique de Villepin, said after meeting with his counterparts in Russia and Germany on Friday that the British and US role in Iraq should end as soon as hostilities do. "In the armed phase, in the securing phase, the primary responsibility, obviously, is that of the coalition forces on the ground," Mr de Villepin said. "Beyond that, the United Nations must play a central role in solving the Iraqi crisis." Britain, too, believes that the UN should play a key role. The meeting of Mr Bush and Mr Blair will be the third in three weeks. Under pressure from Mr Blair, Mr Bush agreed late last month to press for the adoption of a road map for Middle East peace that would lead to the establishment of a Palestinian state on part of the West Bank. US Secretary of State Colin Powell said America would turn to the Middle East problem as soon as the war in Iraq ends. The British and Irish governments have been pressing local parties for months to make a new round of concessions designed to keep Northern Ireland's 1998 peace accord moving forward. Mr Bush's visit appears intended to put pressure on those parties to accept compromise. In Belfast, Mr Bush's visit is seen as offering hope for a major breakthrough in shoring up peace in one of the world's longest-running conflicts. News of Mr Bush's visit was welcomed by local politicians as evidence of US commitment to securing a final settlement to the 30-year "Troubles". Brigit, or Brighid or Bride, then replaces the earlier image of the triple Goddess of the battle field. This image is more appropriate for an artistic society where Bards sung at courts. The three aspects of Brigid are all known as Brigit . They are Brigit, Goddess of Poets; Brigit , Goddess of Smithwork and Brigit, Goddess of Healing. Her fame becomes international - as needed by a more interlocked international society - that has to defend itself against more widespread dangers such as that posed by the legions of Rome. The Brigantes of Gaul called themselves after her sons. Julius Caesar called her the "Gaulish Minerva". Brigit as the Sun Goddess was honoured at sanctuaries where priestesses minded an everlasting flame. Brigit was also linked to the oak - a Sacred Oak stood by the fire sanctuary. Brigit's fire sanctuary was in the City of Brigit now renamed Kildare in honour of her sacred oak (from Cill Dara meaning the Church of Oak ) Kildare remained a major spiritual centre for centuries after the arrival of Christianity. From it Brigit was said to rule the women, leaving the men to Patrick. Brigit was declared the patron saint of Kildare while Patrick became that of Armagh. Today there are many more places named after Brigit in Ireland than there are named after Patrick. After the rise of Christianity in Ireland, Brigid was even said to have been made a Bishop - that is Christian monks in their accounts of Irish history accorded her a rank that made her not a Goddess but a priestess with power equal to that of the Christian authorities. She was reported to be frequently visited by bishops and to appoint the local bishop. This probably reflects the high power of the Abbess and Nuns who seemingly took over the role of her high priestess and priestesses (or who were the same women with a new title). These stories of female bishops show that women in the name of the Goddess had a higher sacred role here than in any other part of Christianity. The Kildare nuns tended the everlasting flame of Brigit while banning the sight of the flame from all men - as had Brigit's priestesses. Their abbess also kept the ancient anti-war aspect of the Goddess alive for among her titles was "She who turned back the tide of war." It was only about 500 years later that the fall of the Abbess from power was marked in the horrid ancient fashion also suffered by Goddesses by her being raped by a soldier in 1132 to render her unfit for office so she might be replaced by a woman chosen by the local king.. But the fires of Brigit in Kildare carried on being tended into the 13th Century. When in 1220 the Papal envoy Henry of London ordered the extinction of the fire, the enraged population forced the Bishop to order the relighting of the flames. This was not long after the English pope Adrian IV had granted Ireland to England. Brigids Place is named for St. Brigid, a fifth century Irish Celtic saint who founded a monastery of nuns and monks based on the social concept of equality between men and women. The religious in this monastery were known for their wisdom and compassion, their hospitality and healing. Brigid of Irelandthe patron saint of poets, blacksmiths, and healerswas born at Fauchart near Dundalk c.450. She was the daughter of Dubhtach, poet-laureate of King Loeghaire, and his bondmaid Brotsech. Because of the jealousy of Dubhthachs wife, Brigid and her mother were forced into slavery. She spent her childhood serving the family of a Druid priest performing the burdensome tasks associated with running a household and a farm. Early in her life she became a Christian. Legend holds that she received baptism from St. Patrick, but this is unlikely. As an adolescent she returned to her father who commanded her to marry. Rather than obeying him, she chose to become a nun receiving the nuns veil from Bishop Macaile of Westmeath. Afterward, gathering a group of women around her, she founded a nunnery at Kildare (Church of the Oak). Needing to have the sacraments performed, Brigid prevailed upon Conlaed, the leader of a nearby group of anchorites, to receive episcopal consecration and to move with his followers to a site adjacent to the nunnery. This seemingly mixed house based upon the Celtic social concept of equality between men and women was unique among Irish religious foundations. Brigid as abbess of Kildare influenced Irish church affairs and headed a network of nunneries as well. Kildare prospered under royal favor in the seventh century becoming one of the most magnificent churches in Ireland during this time. When Brigid died c.525, she was buried alongside Conlaed beneath the altar at Kildare. Three centuries later her body was translated to lie beside the remains of St. Patrick at Downpatrick, one of Ireland's most holy shrines. The shrine was despoiled during the Reformation and its relics dispersed. Her first biographer Cogitosus writing c.650 attributed to her a number of miracles. Later lives added to these miracle stories. Her childhood miracles were associated with the multiplication of food such as providing butter for the poor. As abbess, with the assistance of angels, she caused cows to give milk three times the same day to enable visiting bishops to have enough to drink. Brigid was also credited with taming a wolf at the request of a local chieftain whose pet dog had been killed accidentally by a peasant. Brigids cult spread rapidly throughout Ireland, and as Irish monks wandered throughout England, Wales, and the Continent, they carried Brigids cult into those areas as well. In England at least nineteen churches were dedicated to her, most notably St. Bride's Church on Fleet Street in London. Brigid is still venerated in Alsace, Belgium, and Portugal. Writing in the late twelfth century, Gerald of Wales noted a feature of her cult he witnessed on a visit to Kildare in 1186. There, a sacred fire maintained daily by twenty nuns (nineteen, after Brigid's death) burned continuously. The walls of the firehouse remained on the hill by the abbey church until the eighteenth century. Today, only the foundations remain. One of Irelands most beloved saints, Brigid is known as the Mary of the Gael. She is most noted for her compassion to others, especially to victims of violence, the impoverished, and lepers. On one occasion she gave her fathers sword to a leper. Her father, unaware of her act of charity, became enraged and at a loss to control this daughter who gave away his wealth and possessions. Plaited crosses fashioned from rushes are associated with Brigid. Her iconography depicts her with a cow lying at her feet. Brigids feast day is February 1, long held sacred as Imbolg, the Celtic festival of Spring. Westminster is where it´s Royal Palaces and Goverment officies. Westminster Abbey is the center of this area. All English kings and queens have been crowned here since 1066 and most of them are burried here. Buckingham Palace is the London home of the Queen. If the flag is flying on top it means she is at home. Every day at 11.30 AM the Queen´s guard perform the ceremony of changing the guard at Buckingham Palaca. Close by Westminster Abbey stand a Palace of Westminster know as the Houses of Parliament. It is the supreme law-making body in the country. It consist of the House of Commons and House of Lords. The Commons has 650 elected and paid Members of Parliament (MPs). In House of Lords are peers, bishops and 2 archbishops. General elections to choose MPs are every 5 years. In Britain are two large parties: Conservative Party and Labour party (Today: The Prime Minister is Tony Blair). The Houses of Parliament are the political centre of the United Kingdom, the home of the British Parliament. They were rebuilt in the Neo-Gothic style in 1840 on the site of the Old Palace of Westminster which was destroyed by fire. Almost the only remaining part of the old building, dating from 1097, is Westminster Hall. Great Britain, with its House of Commons and House of Lords, is the oldest democracy in the world today. The parliamentary system as we know it today, throughout the world, can trace its roots to the British Magna Carta, an agreement between a British king and his nobles to share power in 1215. The House of Lords is gothic, lavishly decorated in red, with the throne of the Sovereign, in front of this is the Woolsack, the seat of the Lord Chancellor who presides over the House. The House of Commons, more restrained in style, consists of parallel rows of green leather benches which face the table where the mace (a symbol of authority) is placed. The House of Commons is presided over by the Speaker. 97.5 metres above the Parliament rises the clock tower called Big Ben, one of the best known of London's landmarks. Big Ben is not really the name of the clock, it is the name of the bell (named after Sir Benjamin Hall who gained recognition for having had it made). The strike of Big Ben is known world-wide because it is used by the BBC as a time signal. Most victims of depleted uranium are not soldiers, but civilians, many of them children. John Pilger reports on what one doctor calls "another Hiroshima." On the eve of an election campaign, the Blair government is attempting,with mounting desperation, to suppress a scandal potentially greater than the arms-to-Iraq cover-up. This is the deaths of hundreds of thousands of people, perhaps many more, caused by decisions taken in Whitehall and Washington. Moreover, the evidence of deceit and lying points to at least two Cabinet ministers and three junior ministers. At its centre is the unerring, willful destruction of a whole society, Iraq, the aim of which is to keep the regime in Baghdad weak enough tobe influenced by the west and yet strong enough to control its own people. This is longstanding Anglo-American policy. Contrary to the propaganda version about protecting Iraq's ethnic peoples, the objective is to prevent a Kurdish secession in the north and the establishment of a Shi'ite religious state in the rest of the country, while maintaining the west's dominance of the region and its access to cheap oil. After more than a decade of sanctions, no one on the Security Council wants them, except the United States and Britain. The French foreign minister, Hubert Vedrine, has called them "cruel, because they exclusively punish the Iraqi people and the weakest among them, and ineffective, because they don't touch the regime". Had Saddam Hussein said on television "..we think the price is worth it...", referring to UNICEF's figure of half a million child deaths, he would have been called a monster by the British government. [Former US Secretary of State] Madeleine Albright said that. Whitehall remained silent. The Blair government has played the traditional role of Washington's proxy with particular enthusiasm. The latest Security Council resolution, 1284, was drafted by British officials in New York. They are said to be proud of it. Peter Hain, the Foreign Office minister, constantly refers to it as "Iraq's way out". In fact, it is a specious set of demands, requiring the return of weapons inspectors, but not offering any guarantee that sanctions will be suspended if the regime complies. Last year, Jon Davies, then head of the Iraq desk at the Foreign Office, admitted the "lack of clarity in exactly what the provisions will be". The suspicion all along, says Dr Eric Herring, the Bristol University specialist, is that "US and British policy is one of continually moving or hiding the goalposts so that compliance [by Iraq] becomes impossible and so that the sanctions cannot be lifted". In recent months, in the columns of the New Statesman and the Guardian, [British Foreign Office minister] Peter Hain has defended a sanctions regime that, says UNICEF, is a principal cause of the deaths of at least 180 children every day. Hain's articles and letters are scripted by Foreign Office officials using the familiar, weasel lexicon that denied British support for the Khmer Rouge, the use of Hawk aircraft in East Timor and the illegal shipment of weapons parts to Britain's favourite 1980s tyrant, Saddam Hussein. Sir Richard Scott's inquiry acknowledged their "culture of lying". You get a sense of the scale of lying from Hain's latest letter to the NEW STATESMAN (15 January), in which he claimed that "about $16bn of humanitarian relief was available to the Iraqi people last year". Quoting UN documents, Hans von Sponeck replies in this issue (page 37) that the figure was actually for four years and that, after reparations are paid to Kuwait and the oil companies, Iraq is left with just $100 a year with which to keep one human being alive. That Hain does not appear even to question the competence of those who write his disinformation is remarkable. That he allows the bureaucracy of a rapacious order he once opposed to invoke his anti-apartheid record is a bleak irony. That he is said privately to have serious doubts about sanctions, which he rejected for Zimbabwe, saying they would "hurt the ordinary people, not the elite", is a measure of his ambition, and perhaps explains why he refuses to engage his critics, preferring rhetoric and abuse. Each time he calls a principled, informed critic, such as Halliday and von Sponeck, "a dupe of Saddam Hussein", there is an echo of the apartheid regime calling a young Hain "a dupe of communism". The sanctions issue is one of three related scandals involving epic suffering and loss of life. The truth about the effects of depleted uranium in shells fired in the 1991 Gulf war and Nato's 1999 attack on Yugoslavia, is that the Americans and British waged a form of nuclear warfare on civilian populations, disregarding the health and safety of their own troops. This was largely to test the Pentagon's post-cold war strategy of "all-out war". On 9 January, John Spellar, the Defence Minister, told the House of Commons that the conclusion of many years of research showed "there is no evidence linking DU to cancers or to the more general ill health being experienced by some Gulf veterans". This echoes Peter Hain, who said there had been "no credible research data". In fact, the data is credible and voluminous, dating back to the development of the atomic bomb in 1943, when Brigadier General Leslie Groves, the head of the Manhattan Project, warned that particles of uranium used in ammunition could cause "permanent lung damage". In 1991, the UK Atomic Energy Authority warned that, if particles from merely 8 per cent of the DU used in the Gulf were inhaled, there could be "300,000 potential deaths". Spellar claimed there had been no rise in the number of kidney ailments or cancers among veterans of the Gulf war. The Ministry of Defence has been told by the National Gulf Veterans and Families Association of a dramatic increase in both diseases among veterans. Last year, Speller said: "We are unaware of anything that shows depleted uranium has caused any ill health or death of people who served in Kosovo or Bosnia." Again, this was false. Nato's own guidelines include: "Inhalation of insoluble depleted uranium dust particles has been associated with long-term health effects including cancers and birth defects." It was only after six Italian soldiers, who had served in Kosovo, died from leukemia, that the scandal caused panic in Nato, with the Defence Secretary, Geoffrey Hoon, contradicting himself, saying DU posed a "limited risk", then "no risks", then, bizarrely, that it is "protecting British forces". For the Iraqi people, however, the cover-up continues. What has been striking about the political and media reaction over the past fortnight is that most of the victims of depleted uranium have rated barely a mention. Yet Tony Blair himself was made aware of their suffering when he was sent, in March 1999, UN statistics, published in the British Medical Journal, showing a sevenfold increase in cancer in southern Iraq between 1989 and 1994. It is in southern Iraq that the theoretical figure of "500,000 potential deaths" can be applied, in a desert landscape where the dust gets in your eyes, nose and throat, swirling around people in the street and children in playgrounds. In Basra's hospitals, the cancer wards are overflowing. Before the Gulf war, they did not exist. "The dust carries death," Dr Jawad Al-Ali, a cancer specialist and member of Britain's Royal College of Physicians, told me. "Our own studies indicate that more than 40 per cent of the population in this area will get cancer in five years' time to begin with, then long afterwards. Most of my own family now have cancer, and we have no history of the disease. It has spread to the medical staff of this hospital. We are living through another Hiroshima. Of course, we don't know the precise source of the contamination, because we are not allowed [under sanctions] to get the equipment to conduct a proper scientific survey, or even to test the excess level in our bodies. We suspect depleted uranium. There simply can be no other explanation." The Sanctions Committee in New York has blocked or delayed a range of cancer diagnostic equipment and drugs, even painkillers. Professor Karol Sikora, as chief of the cancer programme of the World Health Organisation, wrote in the British Medical Journal: "Requested radiotherapy equipment, chemotherapy drugs and analgesics are consistently blocked by United States and British advisers [to the Sanctions Committee]. There seems to be a rather ludicrous notion that such agents could be converted into chemical or other weapons." Professor Sikora told me: "The saddest thing I saw in Iraq was children dying because there was no chemotherapy and no pain control. It seemed crazy they couldn't have morphine, because for everybody with cancer pain, it is the best drug. When I was there, they had a little bottle of aspirin pills to go round 200 patients in pain." Although there have since been improvements in some areas, more than 1,000 life-saving items remain "on hold" in New York, with [UN Secretary General] Kofi Annan personally appealing for their release "without delay". The third strand in the cover-up is the killing of Iraqi civilians by RAF and American aircraft in the "no-fly zones". As Hans von Sponeck points out in his letter, these violate international law. In a five-month period surveyed by the UN Security Sector, almost half the casualties were civilians. I interviewed eyewitnesses to one of the attacks described in the UN report. A shepherd family of six - a grandfather, the father and four children - were killed by a British or American pilot, who made two passes at them in open desert. Pieces of the missile lay among the remains of their sheep. United Nations staff - not the Iraqi government - confirmed in person the facts of this atrocity. The Blair government has spent £800m bombing Iraq. 10-27-2002 - ANTI WAR PROTESTS updated 12-21-2002 - THE BLITZ - IS THIS A PROPHECY? PEACE! NOBODY WANTS ANY - WHO CAN DECLARE WAR? IS THERE ANOTHER PEARL HARBOR IN OUR FUTURE? AMERICANS BEING HAULED AWAY IN BOXCARS?